MSL Pressures from a minimum at Sol 1334 to Sol 1404. This article focuses on missing weather data for Sols 1389 through Sol 1397 (9 sols). The page is under construction on 7/20/2016. Between July 3 and July 11, 2016, as I swam laps in our condominium pool at night, I enjoyed looking up into the sky over our home in Cape Canaveral because the view of Mars was spectacular. So, without consulting any books, I knew that there was no excuse of Mars being on the wrong side of the sun to explain why NASA/JPL and the REMS Team had no weather data for sols 1389 through 1397. Then, when they resumed data for Sol 1,398 (at Ls 184), the pressure offered (751 Pa) was far too low based on pressure for the same Ls in MSL Years 1 and 2 (772 and 770 Pa). I expected to see about ~770 Pa. 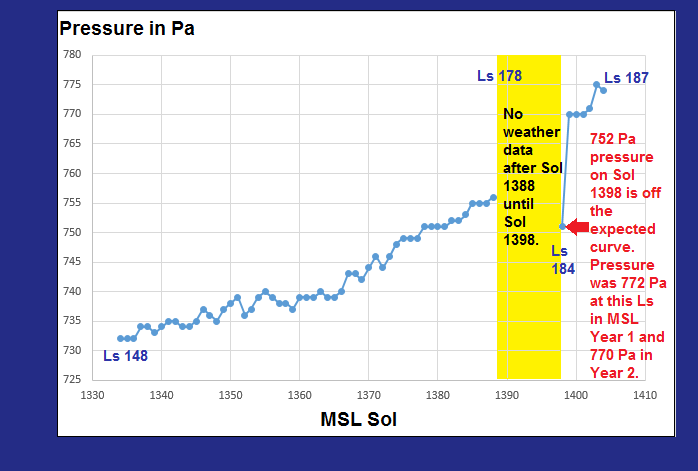 But the pressure for Sol 1399 was right back on the expected curve at 770 Pa. I don’t know if the 751 Pa for Sol 1,398 was based on a partial sol of pressure, with instrumentation just coming back on line. Maybe that will turn out to be the excuse. But the return to the exact pressure expected on Sol 1,399 was likely due to what I have seen before – manipulated data. If JPL can provide evidence to the contrary we will publish it. But the graph below and the tables that follow it illustrate what we have seen all too often before, and that’s a problem, especially for SpaceX if it wants to beat NASA in sending people to Mars. Underestimating pressures there can have catastrophic results. 1335 149 732 5/8/2016 -10 -77 -67 1.675 1 -77 -78 11 0 736 -4 148 N/A H H First day over freezing since Sol 1316 , Pressure remains tied with last year's low at 732 Pa.
1336 149 732 5/9/2016 -12 -75 -63 1.575 1 -76 77 13 -1 736 -4 149 N/A H H Pressure remains tied with last year's low at 732 Pa.
1379 173 751 6/23/2016 -7 -77 -70 1.75 9 -77 -86 16 0 751 0 172 N/A H H (710) Odd that max air temp drops so much while max ground temp. climbs so high.